Farmington, West Virginia (WV), a community in Marion County, was incorporated in 1896 and was formerly known as Willeyville, Willeytown, and Underwood. The town was so named because of the abundance of farmland in the surrounding valley of Buffalo Creek, a tributary of the Monongahela River. An explosion at the Consolidated Coal Co. mine near Farmington killed 78 miners in 1968. Following the Farmington Disaster, the mine was sealed to help contain further fires and explosions within. Recovery efforts commenced in 1969, and, over the next 10 years, the bodies of 59 miners were extracted. The disaster led to passage of the Federal Coal Mine Health & Safety Act of 1969. Farmington is the birthplace of U.S. Senator Joseph Manchin III, 34th Governor of West Virginia, and his uncle, A. James Manchin, a longtime member of the House of Delegates and a Secretary of State. 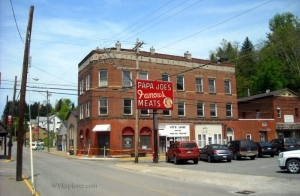 Farmington is located on highway US-250 approximately five miles north of Worthington, West Virginia, eight miles west of Fairmont, West Virginia, and 11 miles east of Mannington, West Virginia. Farmington is located in the Monongahela Valley Region in northern West Virginia.